It’s amazing how fast a year goes! She is just so much fun. Now that she’s mobile she keeps me hoppin’. She unloads every cupboard and drawer in site, whereas my boys never got into anything. I told you…I’ve gone off the deep end. 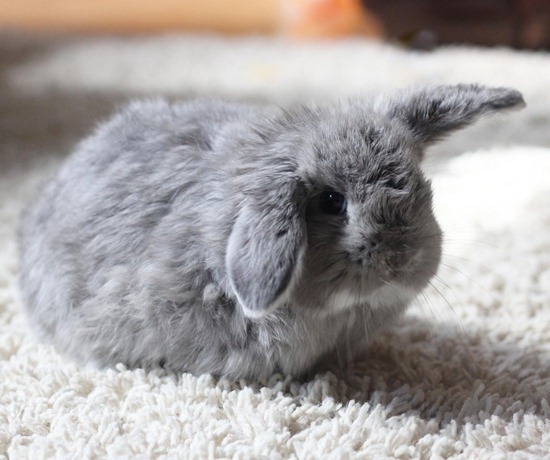 Oh my gosh, that's the fuzziest bunny I've ever seen! How incredibly sweet! How adorable! What a fun present! She is so cute and sweet, is she walking yet? Oh what a beautiful girl you are blessed with. Love the quilt! The girl and the bunny are both super cute! Oh! Is that a mini lop? So cute! Okay, that rabbit is the cutest thing ever! Your little girl is adorable, that year did go fast. Such a little sweetie! Those two little bottom teeth are precious! Oh she's adorable. I can't believe it's been a year already. My daughter after 2 boys was also "in" to everything & had/did everything I never had to contend with either of the boys. Now she's 4, she is such a capable, determined,independent little girl. I just think the more children you have the savvier their personalities are! Happy Birthday adorable little one! She is the cutest by far! I almost got myself a bunny a few months back. I decided against it after thinking for a while…I have a little dog that would just torture the poor thing and I couldn't do that to a precious creature! Your bun-bun is so cute!!! Happy Birthday to your high spirited bundle of energy… I'll bet she really keeps you hopping ! I totally cannot believe it has been a year. She is adorable, and I think I need a bunny! Happy Birthday to your beautiful girl. And how cute is your bunny!! 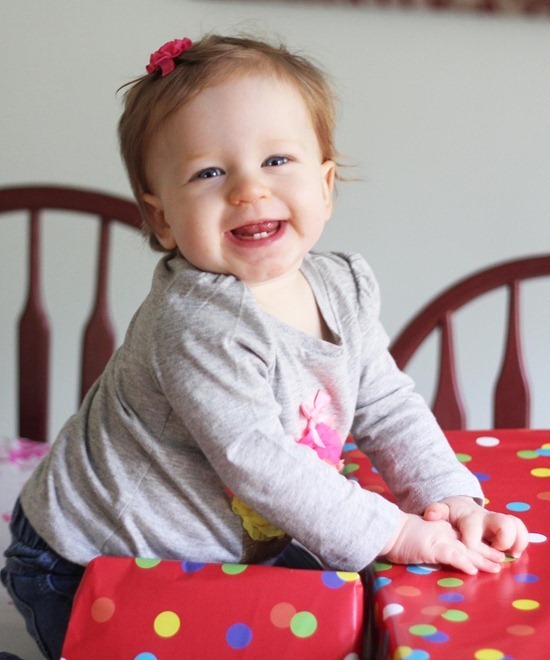 Your little girl is so sweet – my granddaughter is just about to turn one, too! It's such a fun age… And wow, now I want a bunny, too!! The year really has gone past in a flash! That bunny is the cutest (and so it your little girl). Isn't Sarah funny? Hasit really been a year? Precious…the rabbit AND the 1 year baby girl! Squeeeee! A cute baby *and* a cute bunny… in the same post! You are one lucky mama! Menina sabe o que quer…e esta linda pode tudo,ela nasceu no DIA INTERNACIONAL DA MULHER,vai longe!DEUS ABENÇOE. Your daughter is adorable. The bunny is so cute. That makes two, right? Oh Al, that is the cutest picture of Sophie!!!! Loving her and the bun bun. Yup, you've lost it fo sho! Happy Birthday to your daughter! What an adorable bunny. Will he/she be a house pet? My former neighbors had one and it used a litter box. Happy happy birthday to you both! I'm not sure who's the cutest…..baby or bunny. ;) Great pics! Sophie is just gorgeous. Can't quite believe she's one! Look at those teeth too! Can't wait for my Lil to be 1 too!! She is such a cutie. Bet she loves your present to yourself. Both of them are absolutely adorable!! And that bunny is just so cute! Do you have two bunnies now? I think I remember reading about you getting one not long ago. What cute teeth on a beautiful smile! Precious! What an adorable little girl! 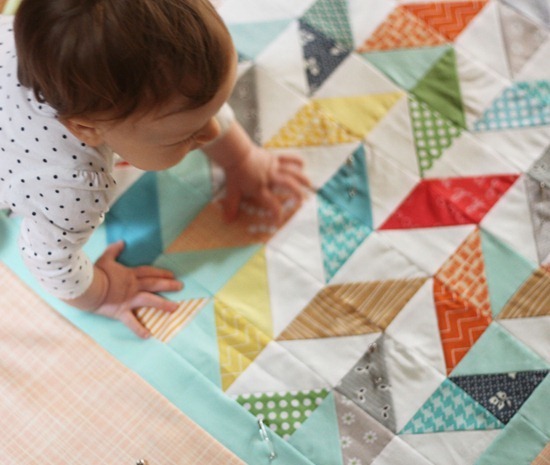 I bet she is going to be quilt the little quilter ;) Cute bunny also. Your sweet girl is adorable! I love your bunny, I have had bunnies in the past and the kids thought they were for them too! LOL. Have a great weekend. So adorable, both of them! Now you really will be kept hopping…pun intended! So sweet! It is amazing how quickly time passes. Adorable bunny, and precious little girl. Happy Birthday and Happy Bunny! God bless this little young lady! She is so cute! Happy Birthday and congratulations to you, mom!! Happiest birthday wishes to little miss Sophie!! Such a sweet little bunny. How many does that make now? Oh such a sweetie, I hope she liked her cake and that bunny is just the cutest bundle of fluff ever! Happy Birthday to your sweet baby girl! I just love, love, love your fuzzy bunny, too! Enjoy!!! happy birthday! How I love the look of two little teeth! Sadly this look is gone so fast. So we need to enjoy this time. She's sooo sweet!! My little girl also turned one on the 7th march!! Happy Birthday mummy and princess!! Kisses from Spain!! Happy birthday! Cute cute baby. Love the gift to yourself as well. I have a rabbit too, so much fun! Happy Birthday! It goes too quick for us mummies. My baby just turned 4, and I wanna keep him little and cuddly forever. The photo of your daughter is gorgeous, such a happy little girl. I would like to get a bunny for my kids. I think a nice easy pet to begin with. Your daughter is such a little cutie. Happy Birthday to her. Is this a second bunny? It looks lighter color in this photo. It can't possibly have been a year already! She is so stinkin cute. OMG, those two teef. She reminds me so much of my baby girl who is almost 6 now. Congrats on the new bunny. It looks so very soft. The kids must be going nuts over it. Your daughter is beautiful!! 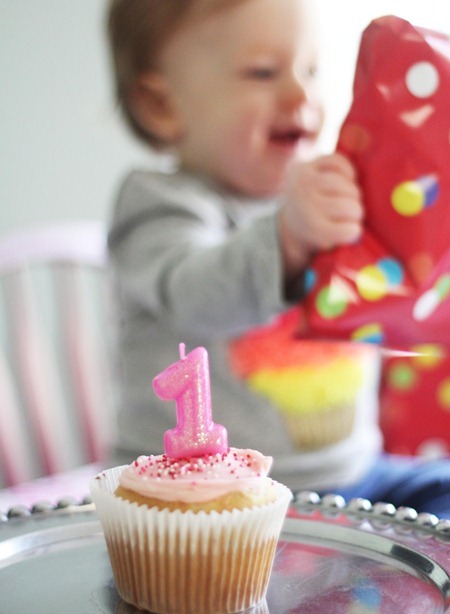 My little girl turned 1 on the 12th–it's a good month ;-) I wish she had hair…and some teeth..like your little girl. Mine is *still* bald and toothless! I love you! Seriously, if we were neighbors, I'd hope we'd be friends, you are crazier than me. ;) Happy birthday to Sophie! They grow way to fast, my littlest is 15mo and I wish there was a way to slow down time. OOOOO how precious! Baby girl and the bunny! So I've been following your blog for awhile now and I also have a new one year old. And the best part about this post is I just bought a bunny for myself too. And I keep thinking what on earth have I done. Glad I'm not the only one.